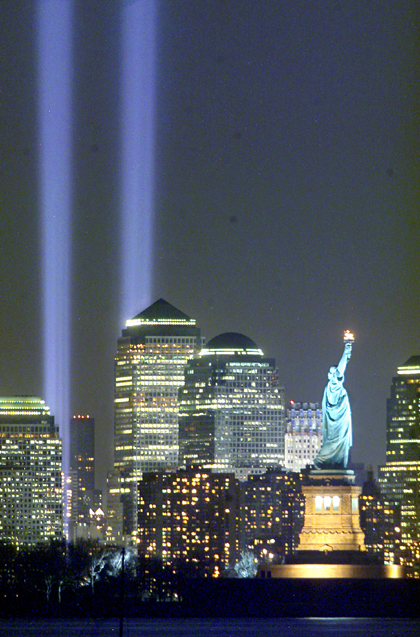 Midnyte Reader: 9/11 - 10 years later. I remember in exact detail where I was, what I was doing and what I was thinking the moment I heard the first plane hit the north tower. I remember almost everything about that day in surreal clarity. 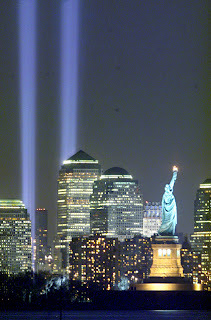 I wasn't planning on writing a post about 9/11. This is a book blog, after all, but I can't seem to not post something. A small tribute, a tiny slice of homage on the worldwide web. I'll keep it short. I live 50 miles north of New York City. My husband watched the towers fall from the roof of a building he was working construction on, I watched on a television screen. I waited numbly until I heard that two dear friends were home safe and had not gone to work that day. One of them called in sick and one is a Port Authority cop who happened to have switched shifts with somebody. Less then a year later guests came to town and wanted to see the WTC site. I didn't. But I took them down anyway. I had to go through the memorial site and museum that was erected at that time alone. The experience was painful and powerful. I understand not wanting to re-hash the memories and I understand wanting to move on and I understand not having a lot of time on a vacation. However, if you are ever in NYC, whether it is 10 years later, 20 or 30, I encourage you to visit Ground Zero and pay tribute to the thousands of people who are now heroes in their own stories. So true, Pam. I'll never forget the fear and confusion of that day. I still can't quite wrap my head around it. Sometimes it feels like a dream because I watched it all on TV which made it seem not real or something. Thanks for sharing your story with us.